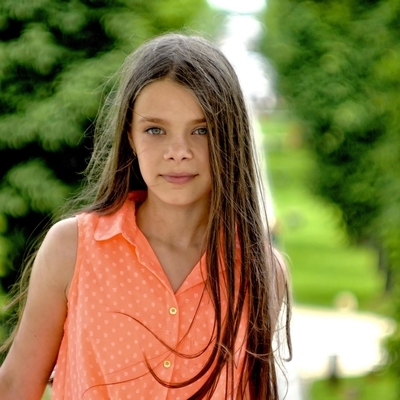 My name is Daria Stefan and I am 11 years old and I am ready to share my music around the world! I am so excited, thankful and grateful that you are here reading this. So, let’s move on, shall we? There has always been 3 consistent things within the Stefan household: God, Family and obviously, Music. Growing up in a music loving family I developed a deep appreciation and love for music. Since the age of 6, I started studying music singing in the “ Miracle Group “ under the guidance of Mrs. Gabriela Sauciuc Cicone and later at 9 years old I decided to try a solo career participating in a lot of competitions, festivals, shows and TV shows, winning many prizes and awards. Also, after a year, I decided to make major changes in my music goals and direction, so I started taking singing lessons from one of Romania's leading teachers and composers – Mr. Marius Teicu, composer of over 500 songs – which has made it’s mark firmly on my musical training. Currently, in parallel with school, I take singing classes at the Art School of Bucharest with my singing teacher Mrs. Viorela Filip. In the spring of 2015, I had the chance to attend the NEXT STAR SHOW – Antena 1 TV, where I delighted audiences with 2014 Eurovision Winning Song – Rise Like a Phoenix. Also, this summer, I had the privilege to be rewarded for my musical career with an Award of Excellence from the Romanian Community from Canada. My latest achievement was winning the contest of The Dray Kid by Disney Channel which gives me the privilege of being the first Dray Kid from Romania. Lately, I have been invited into the live shows in some of the most beautiful and important locations in Bucharest, namely: the Romanian Parliament, the Romanian Government, the National Army Center, Romanian Radio Broadcasting Corporation and the National Library. - American Veterans Radio (USA), MOB Radio (Ireland), Riverhead Radio (New - USA), Museboat Radio (Las Vegas - New York), Pirate Radio (Milan - Italy), Radio universal (Dortmund - Germany ) Radio Wellenflug (Germany). I am a huge fan of Christina Aguilera, Mariah Carey, Celine Dion and Ariana Grande. In my spare time, I love to do artwork, play with my best friend - “my precious … Frodo“ - an amazing Chihuahua, but most of all I love listening to good music. This is just the beginning for me, as the 2015 year brings new material, projects and shows. I hope you are going to follow me on my musical journey and be a part of it.